The Sunday 10:30am Church is popular with young families, with a good number of children, parents, and grandparents in our congregation. 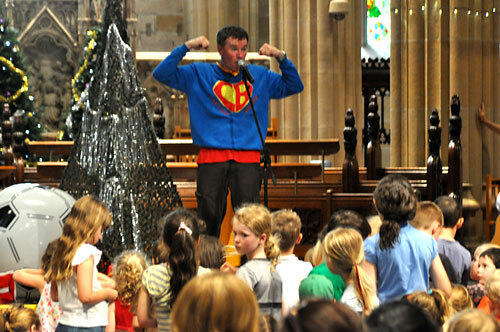 For the children, there is a children's program running during the church gathering, called the Kathedral Kids (see below), and there is morning tea for everyone to share afterwards. Kathedral Kids operates at St Andrew's Cathedral during 10:30am Church each Sunday, where children will have some singing, a Bible story, craft activity and playtime, appropriate to their age. One to three year olds meet downstairs in the Creche room, Preschoolers to Year 5 meet in the Upper Chapter House, and Years 6 and 7 meet in the St Andrew's Cathedral School (opposite the West Door). During the week in school terms, a women's Bible study group meets on Thursdays At Ten (TAT), with creche provided for babies, toddlers and preschoolers. The children have freeplay, storytime, music and playdough, and the older 3-4 year olds also have a craft time and play in the playground, while the mums catch up and study the Bible together. Please bring a packed lunch and drink for your child. Please pack it in a small bag together with a spare set of clothes, ensuring everything is labelled clearly. Please also remember that due to allergies, creche is 'nut free'. That is, no peanut butter, nutella or food with nuts of any kind. You will find the creche room downstairs at the end of the corridor of the Lower Chapter House. Thursday afternoon during school term, Special Religious Education classes are given to the students at Ultimo Public School, from Kindergarten to Year 6. The SRE Curriculum can be viewed at: www.whysre.com.au. If your child attends Ultimo Public School and you would like them to join the Anglican Scripture (SRE) class, please write a note to your school office.